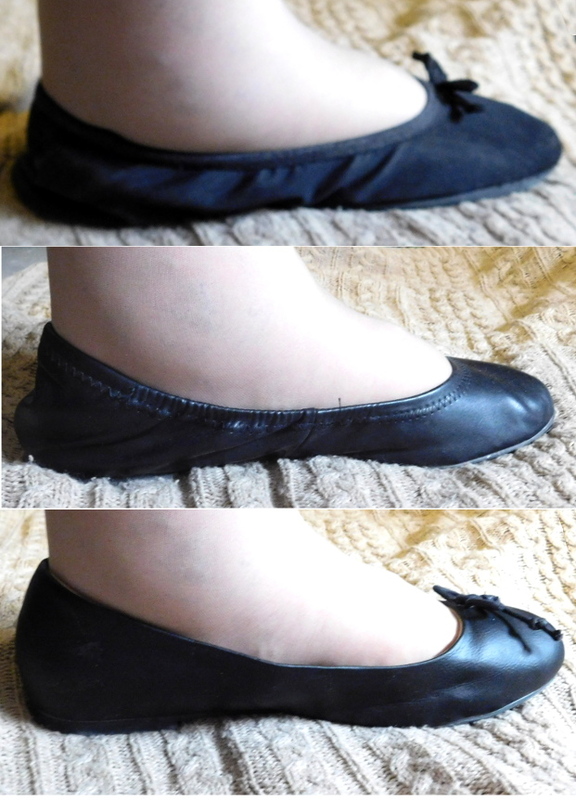 Anyhow, I love ballet flats. A thousand years ago when I was delivering supplies to a law office, I saw that the clerk who signed for the delivery was wearing Isotoner spandex ballet slippers in the office. It changed my world - she looked so comfortable, standing and walking around the office all day long in something that gently massaged her feet instead of boxing them up in the horrible painful dress shoes I was obligated to wear. Obviously I couldn't wear them for my delivery job, but they became my footwear of choice at home. 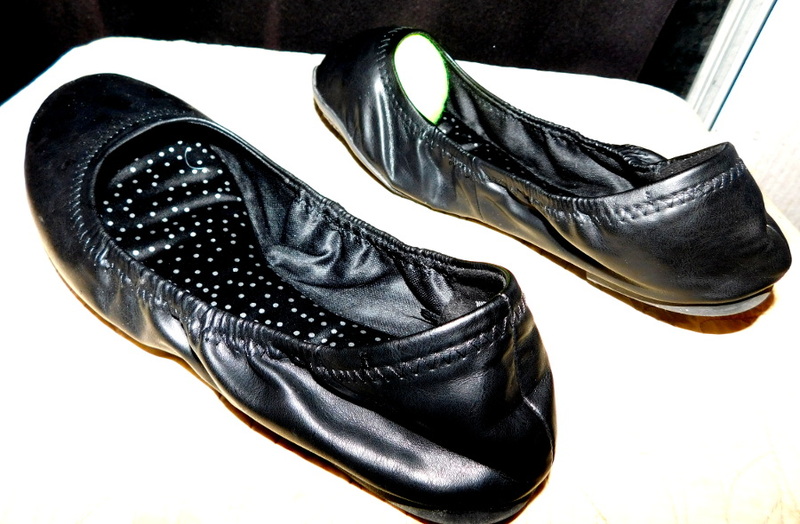 But they were also insanely expensive, so I didn't really become a full-time ballet slipper wearer until the Isotoner patent ran out and cheap Chinese knockoffs were available at Walmart. Now I'm semiretired and what work I do is at home, so I live in those cheap spandex ballet slippers just about every waking moment. Bear with me, this story has a point... I'm just building dramatic tension. The thing is, those cheap spandex slippers weren't really built to be worn upwards of 18 hours a day. Especially since the largest size is really too small for my size-10 Yeti feet, stretching them (the slippers, not my feet) to the breaking point. Then while I was out Christmas shopping I saw some soft leather ballet flats in the clearance bin at Walmart. I've been thinking of trying them for a while now, but I couldn't bring myself to spend $40 or more on shoes. These were only $10, and they had them in size 11 Wide. I figured, size 11 might be a bit loose on me (remember, size 10) but that's better than being too tight. By now those of you familiar with women's shoe sizing are laughing hysterically at my belief that a size 11 women's would be larger than a size 10 men's. NO, not even with the wider model. The reinforced seam at the toe opening crosses exactly over the arthritic knuckle in my right big toe. I was all set to throw them out when I realized that even though they're leather, they still have a bit of stretch to them. I hunted all over for something roughly the size of my foot I could use as a shoe stretcher without actually spending money on one, and found... tennis balls are perfect. Rigid enough to stretch the toe opening but soft enough not to risk tearing the leather. A weekend with my tennis ball shoe stretcher solved that problem nicely. Now they fit very comfortably, although I'll probably need to keep the tennis balls in place whenever I'm not wearing the shoes so they won't shrink back to their original size. Another thing you can use for this purpose is a potato. I certainly remember my folks using them to stretch our shoes when I was a kid. Pepsie, I have found that copious amounts of alcohol solve just about all my problems. Thanks for the suggestion! Hey Ralph! Another lover of ballet flats here. I am in a group on Facebook for my favorite flats--Tieks--an absurdly expensive, but insanely comfortable brand of ballet flats that goes up to size 13. Because the flats only come in full sizes, there is a lot of discussion in the group about how to make them fit (usually people trying to stretch a full size up to the next half size.) There are some disastrous attempts, such as wetting the shoes and stuffing with newspapers. On the other hand, using a golfball to expand the toe box is a favorite, and works really well, similar to your tennis ball effort. Wearing thick socks and wearing them around the house is another favorite. The aforementioned alcohol trick is also a good one that I use on my cowboy boots. Cover the inside leather with the alcohol--isopropyl is the best. Brennk, that's excellent! Nice site. You could look at jazz dance shoes. I’ve got big feet but found that Bloch makes shoes that fit me well. Try online at Discount Dance Supply. They’re split-sole shoes with elastic gussets. So, circling back to this post from January... I wrote it because I found some nice ballet flats at Walmart on sale, very soft leather in a wide size. I got the largest size they carry, 11 (vs. my men's size 9.5). But they still pinch my feet something awful at the widest part of my foot, across the toes where they join the rest of my foot. Got 'em today... and there's a good half inch between my heel and the back of the shoe. I'm so damn sick of erratic sizing on women's clothes! Already packed up for return, but based on my foot size (26cm) I should be getting a 10, maybe a 10.5. Even though 11 in the (softer, stretchier) Walmart shoe is a bit tight not only along the sides but against the heel. Except that specific brand, unlike other brands, says that a 10.33-inch foot needs a size 9 shoe. But other "what size shoe should I get?" charts have completely different sizes for the same foot measurements. I'll say it again: I'm so damn sick of erratic sizing on women's clothes! 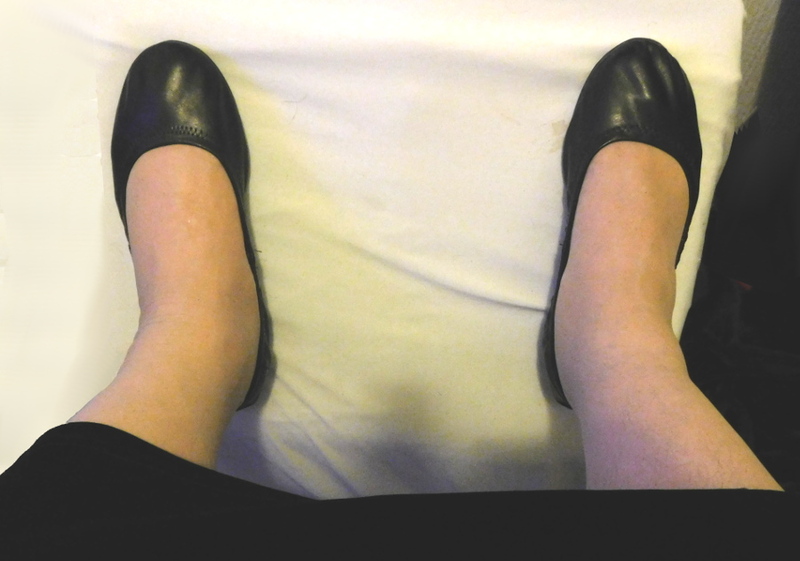 I ordered two different style ballet flats at Shoe Show on line when they came they were supposed to be WIDE but were not at all. I took them back to one of their stores that I found out belonged to them here in town. I tried on several pairs in the store and none of them were wide no matter how long they were. I could not get them on. Again the mis-mash of sizes is among the most stupid things I know. Why cant they all just agree on the same size for all manufacturers???? Well for what it's worth the width does seem adequate. The important thing is to order "extra wide" and not just "wide". those are good looking shoes. I want to try a pair. hops wrote: those are good looking shoes. I want to try a pair. See the links in the Mar 11 post! Just be careful which size you get. When I get the refund for those large ones, I'll scale back down to 10 or even 9.5 extra-wide. Ralph wrote: Well for what it's worth the width does seem adequate. The important thing is to order "extra wide" and not just "wide". Now that would be a problem when they don't offer them in Xtra wide, most only in normal or wide widths. All right, one more followup and I'll quit beating this dead horseshoe. When we last saw our hero, I had ordered a pair of Luoika ballet flats from an Amazon provider who swore six ways from Sunday that their "extra-wide" shoes were such a great fit for wide feet you could stop ordering an extra size or two up. I wasn't convinced, because I had a size 10 pair from Walmart that were supposed to be wide and they were still too tight both side-to-side and front-to-back. So I ordered a size 12 (in men's, I wear 8.5 wide). Sure enough, as one of the photos above shows, they were entirely too big with a large gap between my heel and the back of the shoe. Based on Luoika's size chart, my 10.25-inch long feet need a size 9 women's, but I wasn't about to get stuck with sending back yet another pair I couldn't use and I figure slightly too large is better than slightly too small. I wanted 9.5, but that was sold out so I went with 10 instead. Those arrived, and... even though I ordered a half size up from what the chart said, it was too small. HOWEVER: I know that my outdoor work boots (Justin brand cowboy boots, all leather) needed some time to stretch around my feet. I used my trick of leaving a tennis ball in the narrow part of the toe overnight, and spent some time softening the leather with a hair dryer. Now, three weeks later, I'm glad I went with the 10 instead of larger. Lengthwise the shoe is a perfect fit, and after all this time stretching with wear (and with the tennis ball) the width is starting to feel comfortable too.